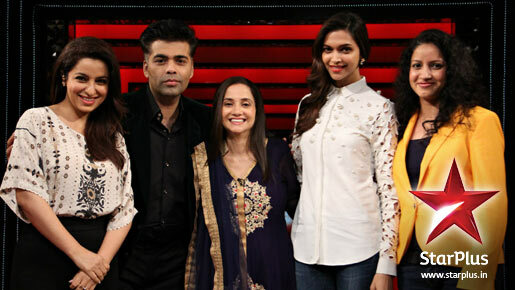 Guests on the show: Deepika Padukone (Bollywood Actress and superstar), Karan Johar (filmmaker), Tisca Chopra (Bollywood Actress and author of the book – Acting Smart) and Priyanka Sinha Jha (Author- Supertraits of Superstars and Editor, Screen magazine, Indian Express group). She starts her show and first gives a review on one of the latest released movie – Hawaa Hawaai directed by Amol Gupte. She says that Amol’s speciality is to make children-oriented films as his past well-acclaimed films were Taare Zameen Par and Stanley Ka Dabba. She feels that in his movie the Kids are not acting but living their life and Amol has just captured them on his camera. become a skating champion. With the help of his friends, he tries to fulfill his dream and Amol’s talented son Partho has potrayed the role of the aspiring kid – Arjun. Arjun learns his skating just by watching a rich student’s skating coach teaching his students. Amol goes further and also makes the coach played by Saqib Saleem to depict the Eklavya story thus making the story very emotional and this is the drawback of the movie. The strengths of the movie are kids and in particular Partho (who is also a national award winner) put in spirited efforts. She also liked the performance of the kid Arjun’s friends – Ghoora, Abdul, Bindass who works in car garage and other businesses. She suggests people to watch the movie as it shows the plight of young children which is a reality in our country and gives it 3 stars.. The next movie review is Mastram which is a story of an author who starts to write pornographic books. The bank clerk – Rajaram writes stories with different names and with a fake name Mastram. Mastram’s readers are men of different ages and they are connected because of their inherent hidden desires. Mastaram soon becomes popular but it effects Rajaram’s own relationships. She says the movie’s story is fictional but certain events from reality are also added in the movie. In the movie, it was a fact that Mastaram was popular in North India and once the people came to know the author of Mastram is Rajaram then they cornered him as well as the book. She says that movie has lot of dimensions and tracks which should have been much polished and improved. The director Abhishek Jaiswal followed a very simple and naive approach and also the actor Rahul Bagga is a good actor but he was unable to convey the role of Rajaram well. The movie could have done much better due to many components in its story line – writer, art, hidden desires, fake faces, market of authors but the film covered only some components well. As a result, she gives 2 stars to Mastram. – Says that if kids are given opportunities they will succeed. – Partho was good and his friend Gochi was very good. After the review, Anupama comes to the main crust of this episode which is – Making of a Superstar. She speaks on how stars are made and what are the secrets to become a star and she then welcomes her guests (Karan, Deepika, Tisca and Priyanka) on the stage. Anupamam asks: In stardom, what is that X-factor ? Deepika: You cannot create one. 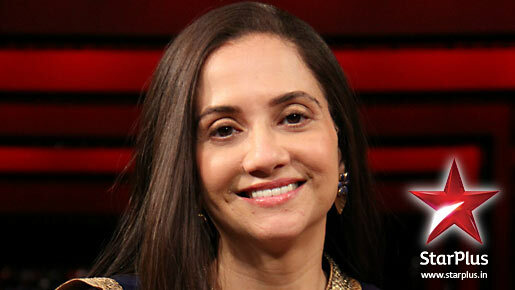 She says that SRK, Aammir khan have X-factor which is a intangible quality and very hard to understand. Karan also talks the same about X-factor like Deepika and he doesn’t know exactly what it really is. Anupama: asks Tisca, Do you need to have a good destiny much more than your talent? Tisca: says that thinking is important and sooner or later you will be accepted based on your attributes – Conviction, Passion, and Determination and talent. With this, your stardom will sustain. Karan says that surname is very important as the opportunities are close enough. He cites about Ranbir Kapoor’s entry where his first film Saawariya didn’t do well but Ranbir’s choices and work in films later were off-the beat and he became successful. Anupama asks: Tisca about her book Acting Smart and her experience of watching Bharat Bhushan working as a junior artiste. Tisca: She talks about her experience on a film set to meet a director of a movie. That was the first day of his shoot, and she saw there Bharat Bhushan working as a junior artiste even though he was a well-known star many years ago. This has made her realized the value of acting and the role of various dynamics – box office, age of actor that is attached to film industry. She says that we should not lose our identity and tells that if we measure stardom by the size of your vanity van, or many assistants then it means that the essence of your stardom is very narrow and it will not lasts long. Anupama says that in Priyanka’s book there is a chapter which talks about Karan and attaches diplomacy as his unique attribute. Karan laughs after hearing about his diplomacy trait. Priyanka says that Karan always speak nicely with people and also speaks that Karan gives frank advice to some people close to him. Karan says that its actually he glorifies fakeness. Nobody wants to hear the truth and cites his example of congratulating people as a courtesy though he might not like their movie during its trial day. Priyanka says it is just an opinion and people thinks of conspiracy theory. Karan says about he heard people talking about sabotaging movies by industry members. Karan says that its not possible to sabotage a specific movie. Anupama asks them: What are the qualities to become a superstar ? She first asks Karan and reminds him about his saying that he chose Varun and Siddharth for Student of the year movie because he saw goodness in them. Karan replies to her question and says that he cannot work with people whom he doesn’t like or doesn’t share good rapport. He used to know both Varun and Sid as they were his assistant directors for his movie My Name is Khan and he finds both good at heart. He also acknowledge that at the time of signing them for the movie he was well aware that they have star quality but are not too talented like Irfan Khan and Nawaazuddin but he signed them. Karan speaks about Alia’s innoncence and irreverence. Deepika says that during her first film with SRK, he has suggested her to work in movies with people with whom she will have a good time. She says that advice is reasonable because it takes time to emotionally connect with people on different sets. Anupama says that SRK has given her the right advice. Anupama then asks them to give a final advice to the show viewers before leaving the show. Al Pacino told her concisely that – Acting is the art of empathy. There should be no difference between you and your role when you are essaying a character. You should be deeply involved with the character. Tisca says that will only happen if you have removed your selfishness and self-centredness. Karan steps in at that point and says that there is one more important thing which is to acknowledge other’s brilliance and learnt from them. He shares an experience of watching Lagaan and during the same year his own movie Kabhi Khushi Kabhi Gham was about to release. He felt so awe of Lagaan that he believes it to be featured in best 100 movies of all time in every book. He then understood that he cannot make a movie of that caliber but will appreciate its brilliance – as it has sincerity, honesty, hardwork and intensity. Karan says that ‘Delusion is a big disease which you should never have’. Anupama thanks the guests for coming on her show and then signs off by saying – Watch cinemas and think on cinemas.